Full Episode! Mirakkel Akkel Challenger Season 9 Episode 41. Posted by Zee Bangla MIRAKKEL AKKEL CHALLENGER on Thursday, March 10, 2016. Mirakkel Akkel Challenger, the King of Comedy of Bengal, is back with its laugh-riot and rib-tickling humour to entertain the viewers. This Reality Show broadcast on Zee Bangla TV channel offers a platform for stand-up comedians across Bengal (both India and Bangladesh) to showcase their talent. 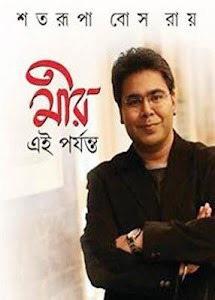 Mirakkel is named according to a famous TV anchor Mir's (Mir Afsar Ali) name. This show directed by Subhankar Chattopadhyay and judged by well known television actors : Paran Bandyopadhyay, Rajatava Dutta and actress : Sreelekha Mitra. Theme of Mirakkel Akkel Challenger season 9 is : "Laughter on. Tears Gone". 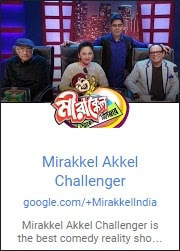 If you want to get invitation in Mirakkel Akkel Challenger season 9 then send your jokes with your Photo to Zee Bangla WhatsApp number : 8335820222 . You can also send your video to this number to get invitation.